These folks don't tweet, but by God, if you see this truck GET IN LINE! 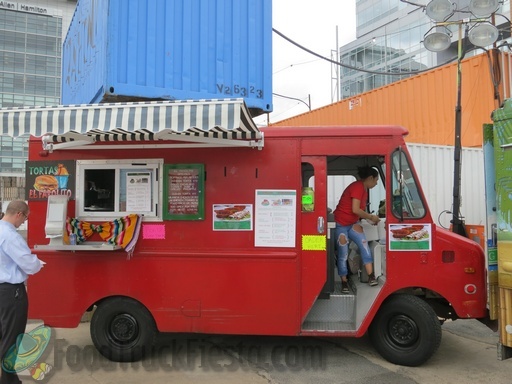 This is the best low-profile food truck in the city. These sandwiches are huge, extremely delicious, and a great bargain. They call it the "Mexican cheeseburger," but that's not a fair comparison -- there's no patty, and the cheese is sort of like a very stringy mozarella, but firmer and a milder flavor. Honestly, these are the bomb. I had a milanesa torta, which is a mexican sandwich that includes black beans, guacamole, lettuce tomato, mexican cheese (delicious! ), jalapeños, onions and a breaded thin cut piece of meat (milanesa). It was super tasty and big, but not too big (I ate the whole thing!). the bread was really good too. This sandwich has become my favorite DC sandwich. They also serve jarritos (mexican sodas). The service was very friendly but a little bit slow. Also they need to get a tweeter account. Tortas El Farolito serves a variety of latin food in Washington DC and has a Facebook page, but no Twitter. 🙁 They do not announce serving locations.